In 1920 John Maynard Keynes (British economist – considered the most influential in the 20th century) wrote that “By a continuous process of inflation, governments can confiscate, secretly and unobserved, an important part of the wealth of their citizens.” The U.S. Government and the Federal Reserve have successfully inflated prices for a hundred years, and especially since 1971 when Nixon eliminated the gold backing of the Dollar. Inflation is like a hibernating bear; it sleeps for a time (the 1990s) and then wakes for a long rampage. During significant inflation, caused by excessive deficits, debts, expansion of the money supply, and printing money, you can lose most of the real value of your savings and your retirement, while your expenses rise far more rapidly than your income. Many countries have experienced hyperinflation in the past three decades; with the wrong fiscal and monetary policies it can happen in the United States. 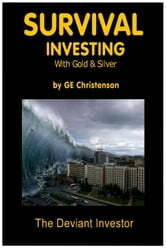 Even modest inflation will, over time, destroy the purchasing power of your income and savings. We must prepare for the coming inflation or suffer the horrific financial consequences. This book describes, in simple language and concepts, the economic and financial conditions that create an exponentially increasing money supply, runaway spending and debts, and price inflation. The loss of purchasing power is demonstrated for working and retired individuals. Specific suggestions are given to reduce expenses and increase savings, so you can invest savings and grow your retirement to keep pace with inflation. Inflation hedges are discussed, and their ability to preserve purchasing power is illustrated in a ten year table. Supplementary topics are discussed in a “Bonus Material” section at the end. Those topics include the ongoing exponential rallies in gold and silver, projections for their prices in 2013, Technical Analysis, using an IRA to invest in gold and silver, and maintaining purchasing power.